Home Costs > How Much Does a Chain Link Fence Cost? Chain link fences are light in construction and, unlike a wall or privacy fence, it doesn’t block the view since it isn’t made of solid brick or concrete. These fences, once installed, can vary anywhere from three feet to as tall as 12 feet; however, common heights will be within the three to six foot tall range. The cost of a chain link fence is going to depend upon the length of the fence, the brand, geographical location, where the fence is purchased from and if a contractor is used to perform the install. On average, chain link fencing is going to come packed in rolls that usually measures out to 50 feet per roll. On average, these 50-foot rolls can cost anywhere from $50 to as much as $200. This, of course, is the material charge and won’t include professional installation fees. It also won’t include the necessary supplies and walk-thru gate. To have a professional company install the fence, most companies will charge by the linear foot and the type of fencing being installed. If there are slopes or the land is not even, the cost can significantly rise. Plan on spending anywhere from $7 to $17 per foot to have a fence installed for a four to a six-foot tall fence. Since there are so many variables, the height, type, gauge, mesh size and where you live can affect the price. Chain link fencing will be characterized by “gauge,” and the lower the number is, the greater the strength will be. On the market, numbers will be anywhere between six and 12, and a grade six will be used for high-security purposes, while a higher number will be used for residential purposes. If you were to do it on your own (DIY), plan on spending about 40 to 50 percent less than the quotes mentioned above. As noted above, a chain link fence will be categorized by its gauge size, usually between six and 12. The higher this number is, the greater the strength will be. Also, the mesh size, which can fall between 3/8″-2-3/8″, will indicate the size of the opening in between the fence loops. 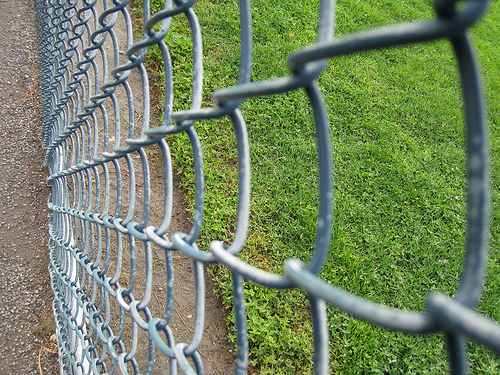 Most chain link fencing will be made from a galvanized steel wire, a material that protects the fence from rust; however, there are are some fences that will have a vinyl coating, which can increase the costs. Vinyl coated chain link fences will come in colors, such as black and green, and will often be chosen due to the look. During the installation process, contractors will first dig post holes and will set them in concrete, allowing the posts to dry for a few days. Once dry, the top rails and the post fittings will be installed, followed by stretching the mesh from post to post to tie it into place. Lastly, all gates will be installed. Lowe’s shows you how the average chain link fence will be installed. If an older fence has to be removed, professionals may charge anywhere from $1 to $5 per foot depending on the complexity of the fence layout. Besides the chain link fencing material, additional items such as posts and concrete will be needed to support the fence. Other items will include the rails, the tension bands, bars, as well as the caps for the top of the posts. This needs to be factored in if you’re going to do it on your own; however, if you’re going to choose a professional, most will include the materials with their total quote. Gates that allow someone to enter the yard can cost anywhere from $50 to as much as $500 depending upon the type of gate required. Some of the gates available include a double, single or a basic design gate. While optional, some opt to install slats in between the open weave to offer privacy, these slates can be installed for about $1 to $2 per foot. A fabric screen, which is another privacy option, can cost up to $20 per foot installed, depending on the material and height of the fence. Permits may be required if you’re building a fence for the first time. Depending on where you live, this could be another $100 or so. Upgrading the materials to vinyl or aluminum, for instance, can increase the costs by 20 percent. You may find that some contractors will only work on projects that are so big and will have a set minimum before they accept your job. Be sure to ask before you get an estimate. Before you even get quotes, call 811 to have a utility company come out and mark any underground utility lines. Also, check with your local zoning laws to see if any restrictions may apply. Some cities will allow fences, but they will have a certain height and material rule. For example, some cities may forbid chain link fences and/or will ask that the fence sits back from the property line by a certain amount. The two biggest complaints with a chain link fence will be the aesthetics and the privacy concerns. Always get estimates from at least three different contractors. If you don’t have the time to get the quotes, consider getting free quotes from licensed and insured contractors in your area at HomeAdvisor.com. Here, you simply explain your job and contractors will get back to you with estimates. When choosing any contractor, see if they will pull the permits, if they will contactt the utility companies and how long the job will take them. Chain link fences are one of the cheapest fencing materials on the market, so if you decide to have a fence installed, keep in mind that this is one of the cheapest options available. If performing a DIY job, consider looking for used chain link rolls on Craigslist. Sometimes, owners may take apart a usable fence and will try to resell.